We use EXE setups to be able to automatically check if all installation requirements are met. To uninstall old versions automatically, to automatically load the required programs in the correct versions or to decide whether a 32bit or 64bit version of the program should be installed on the computer. For a few computers, it may happen that the EXE setup will not install and will display an error message that a process can not access a file. To still be able to install the software, the MSI setup must be done in place of the EXE. Almost every company uses virus scanners on both clients and servers. Most recently, one of our customers had a problem that after an update to the latest version iPaper, server utilization has risen by a few registered users to 100%. DThe problem is caused by the virus scannert. 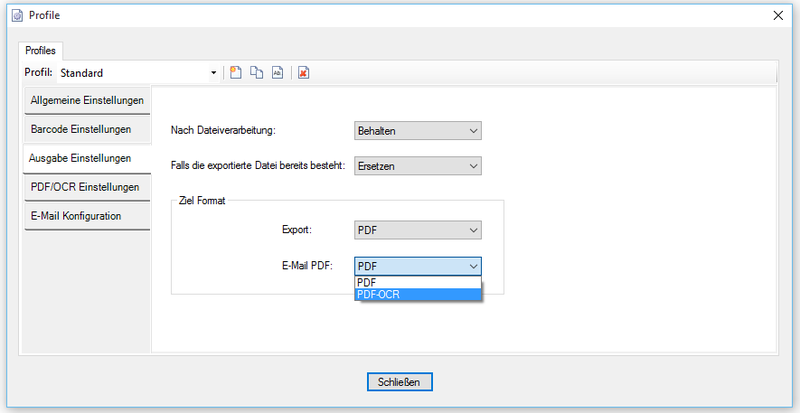 As eDocPrintPro plugin installed, these functions can be performed after the PDF printing. 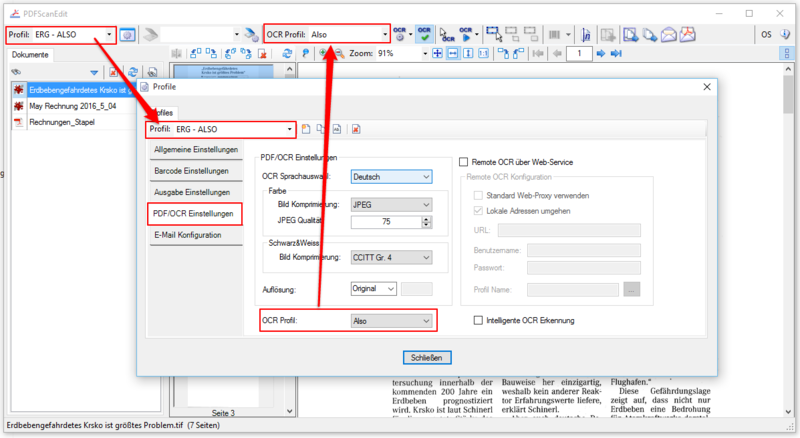 These functions can be performed also on existing PDFs using the eDocPrintPro DropZone drag and drop or via hot folders. The settings can be exchanged both between different applications ( FileConverterPro, EMail Archiver, PDFExport Settings Editor, …) and between different workstations. The independent and freely available PDFExport Settings Editor makes it possible to create and edit such GFIX configuration files independently. For security reasons all our Setup’s and applications are using a SHA-256 “Code Sign Certificate” signed by Symantec . However, there are installations in which the e.g. (Citrix) terminal server also for safety reasons has no connection to the Internet. If now called a signed application, the validity of the signature is checked and this may require an Internet connection. Where there is no Internet connection, so the startup can take a long time, because first a “timeout” expires before the application starts. In order to enable in this case a quick startup, the verification of the signature can be disabled. 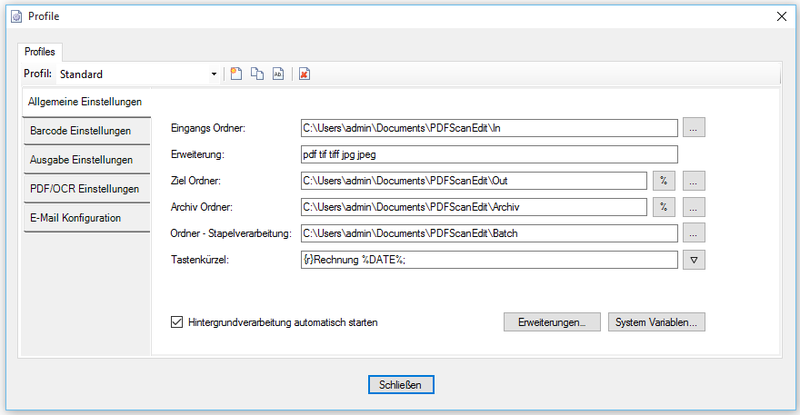 Given the configuration file named ipaper.UI.exe.config must be copied into the iPaper program path C: \ Program Files (x86) \ iPaper.NET. When a document or a program is digitally signed, or the root certificates are not actual, so Windows tries to execute a signature validation on the Internet. If no Internet connection available, this process runs in a time-out and will be continued only after some time. This application seems inactive, or need very long to start. 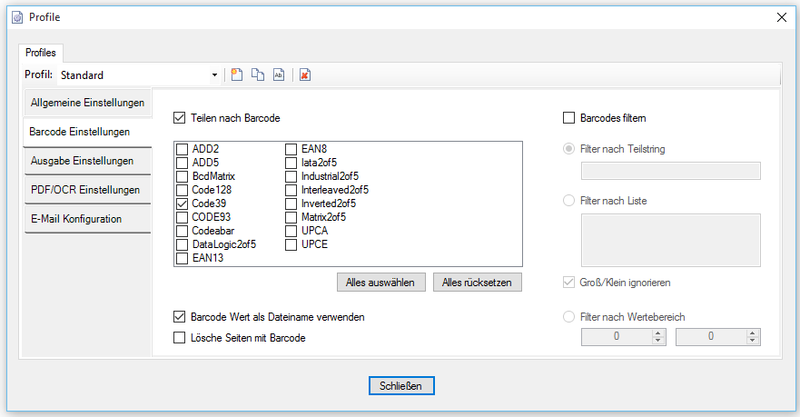 Field-Typ – Barcode: With the new field type barcode, it is now also possible to define fields (areas) as type “barcode”. 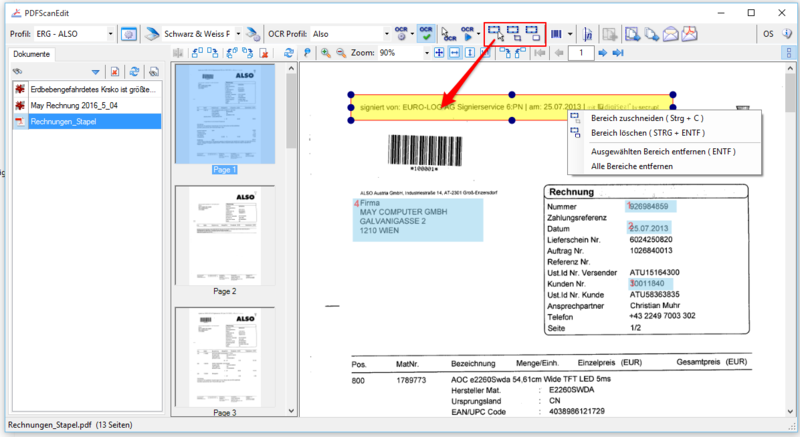 From the specified range will not be read the text, but carried out a 1D barcode recognition by the selected bar code type and the recognized value is returned. Improved anchor / search field function: Fields can be set in relation to an “anchor / search box” field. The anchor field can be searched on the page through a text or substring search text. If the term is found, the other fields are read in relation to this field. So, for example, can be found and read “total amount“ and all the related fields – net, VAT, gross. 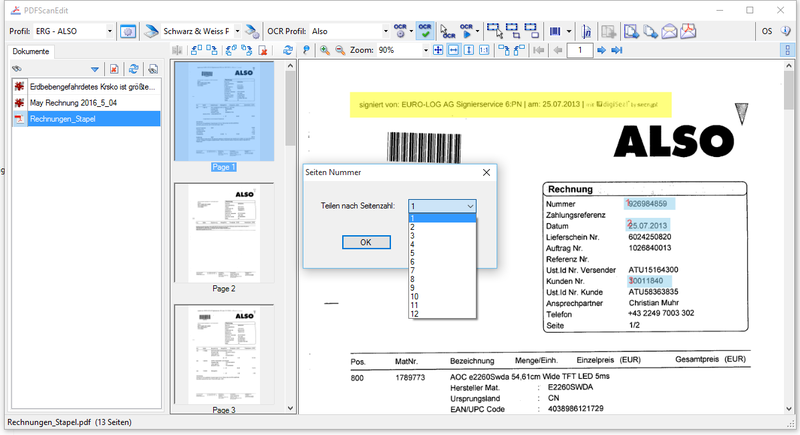 This feature is important for the processing of scanned documents, because it is not guaranteed by the scan that the readout fields are always in the same position. 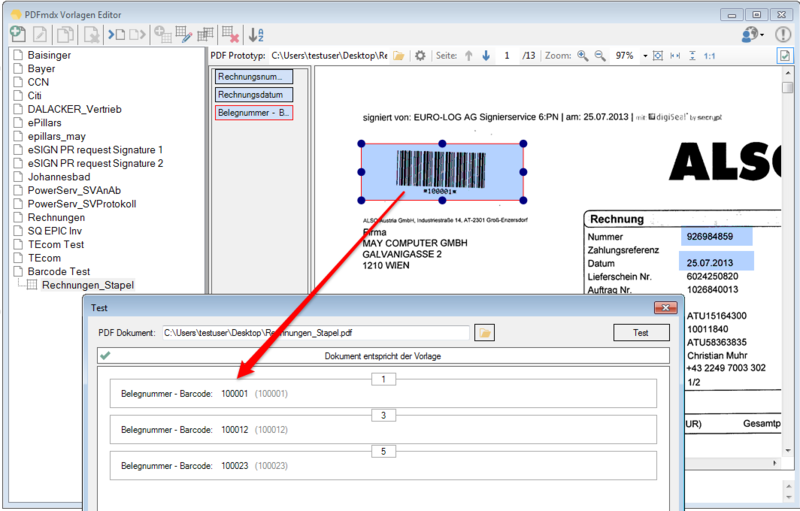 Also barcode fields can be set and read relative to anchor fields. Installable plugins – for profiling and detection metadata to store documents into external DMS / ECM / archive systems. One or more plugins can be installed and selected – each plugin contains its own custom logic for profiling. Plugins are independently installed .NET / C # applications that fit into the framework PDFScanEdit base and use its functions. 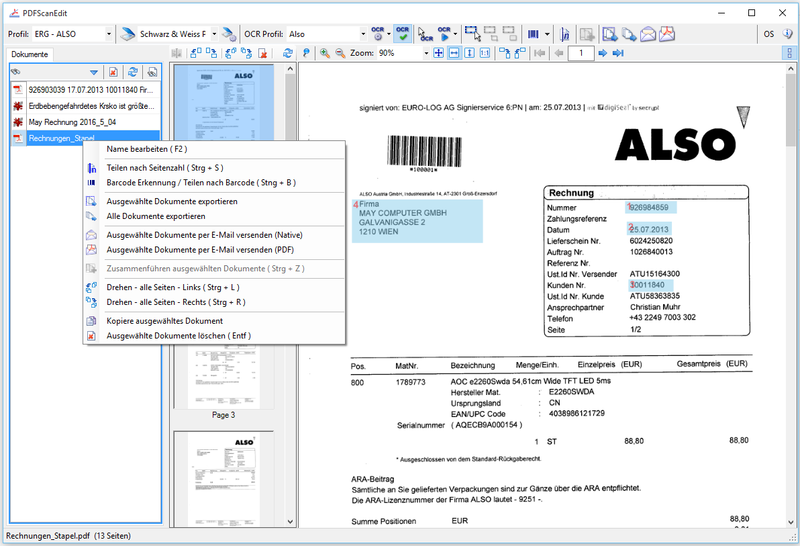 Simultaneous display of the profile mask and the documents preview when capturing the metadata. Programmable logic and features of the Profile mask with e.g. external XML template rules with dynamic fields to always build the name / title identical. 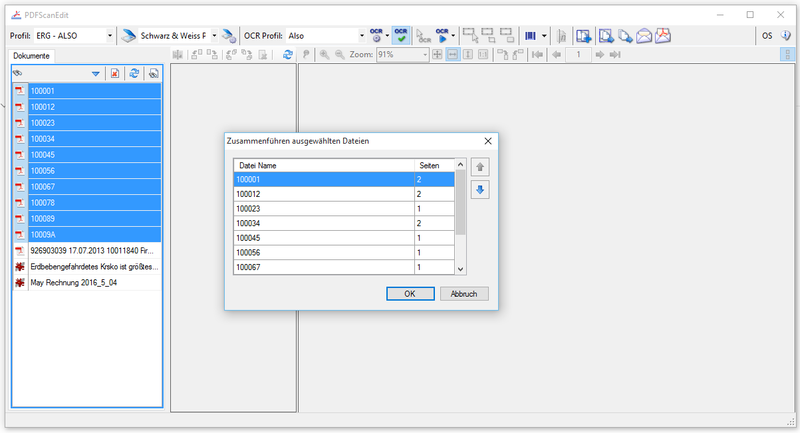 Access to external data sources – MS XLS, SQL, Web Services (SOAP, REST), linked tables and default fields with values from the table. Type ahead substring search on single or combined fields, using categories as Lookup’s, allocation of existing tags, automatic creation of new tags, Automatic creation of folder structure and file names of profile field values, Search Folders, Counter via web service, stamping of document before uploading with information from the metadata, search for existing documents and acquisition of profile values, etc. 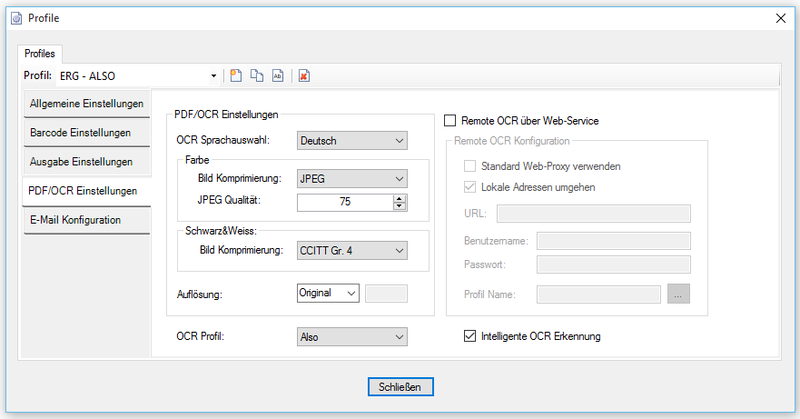 Background / Batch processing – for PDF OCR conversion and uploading – users can already operate during the OCR processing and the upload in the background. Automatic loading of the next document from the list – the processed document is deleted after uploading or moved to an archive area. 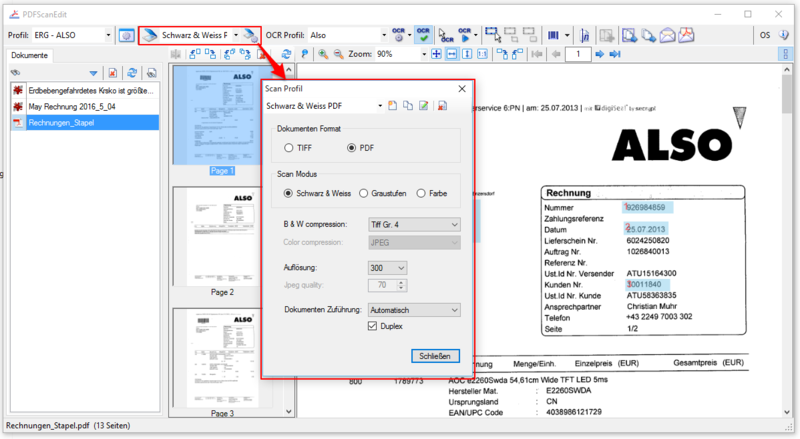 PDFScanEdit provides, easy to use, page-oriented functions for comprehensive processing of PDF and image documents. 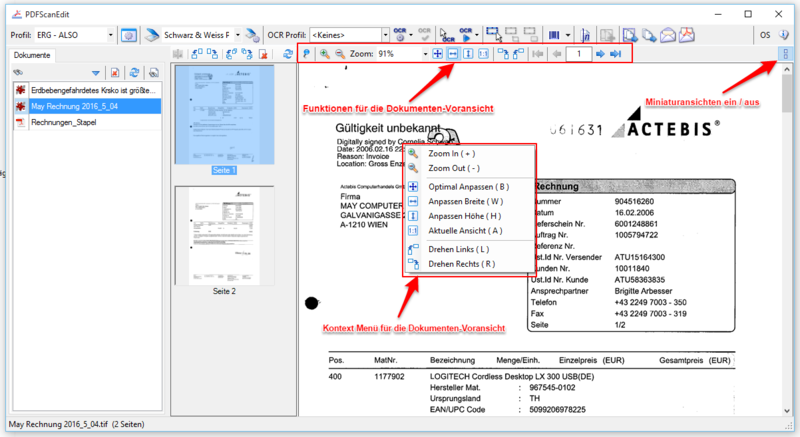 A tool should not be missing on a workplace because it provides the most important and most frequently used functions for editing PDF scanned documents. Processes PDF and image files. Black & white, grayscale, color, – it is not necessary to pay attention to differences in file format and color – all functions are implemented across. 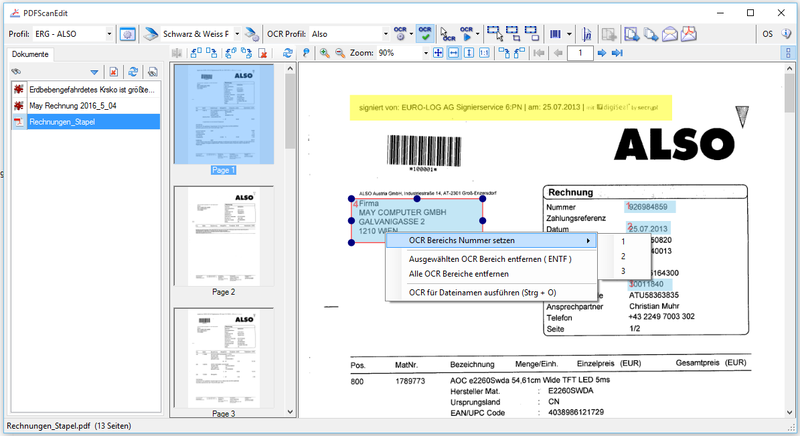 Integrated scan function to capture documents via a locally attached TWAIN scanner. Scan settings can be selected directly via presettable scan profiles. 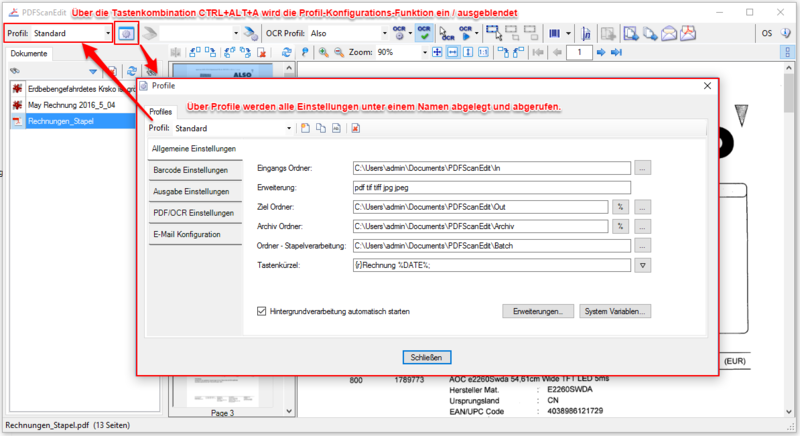 Process documents from input folders – display a list of documents as for MFPs, network scanner with Scan to Folder function. 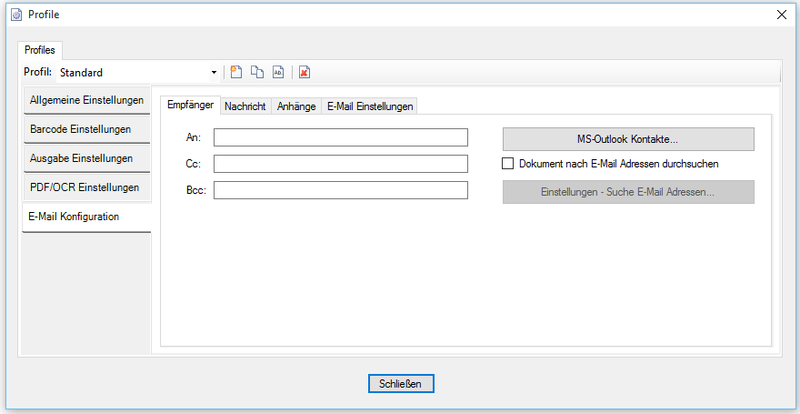 Process documents via the printer driver, and via e-mail received documents. Quick change of documents name – with automatic selection of the next file in the list after completing the change. 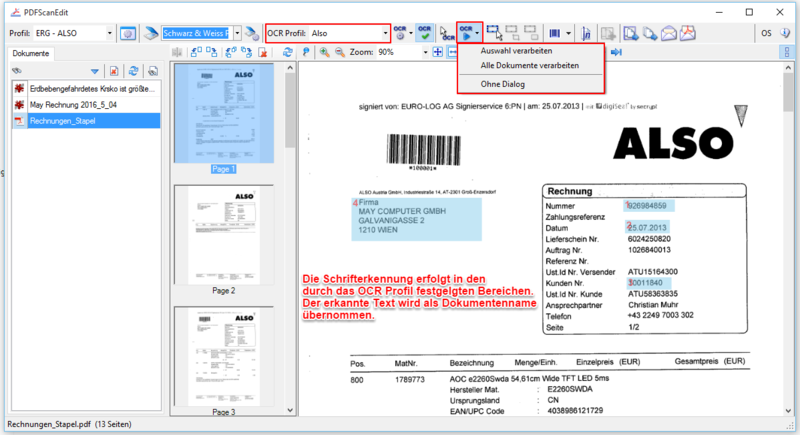 Area OCR via the integrated OCR engine to generate file names from the document content. 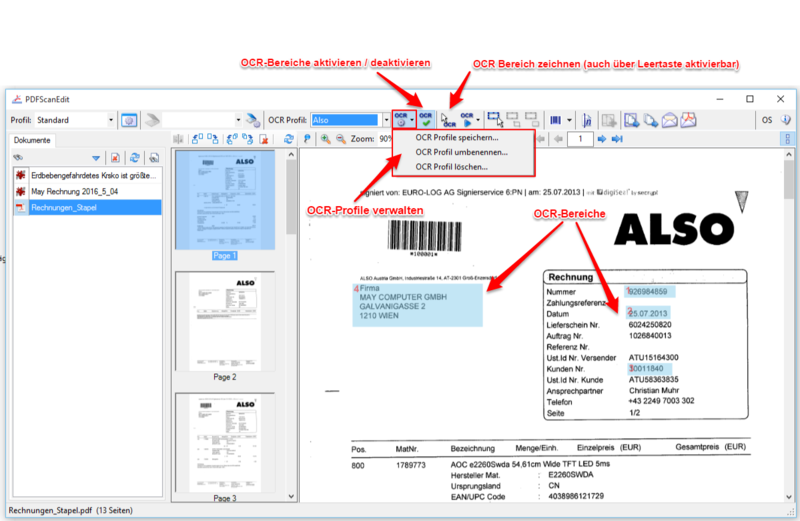 Using OCR profiles – areas, fields are positioned on the page or in the document and can be saved as OCR profiles and reloaded. 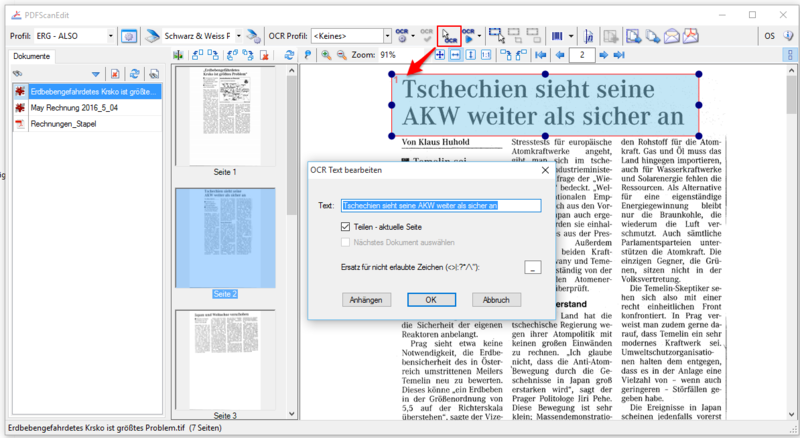 The OCR recognized text areas create the file name of the document. 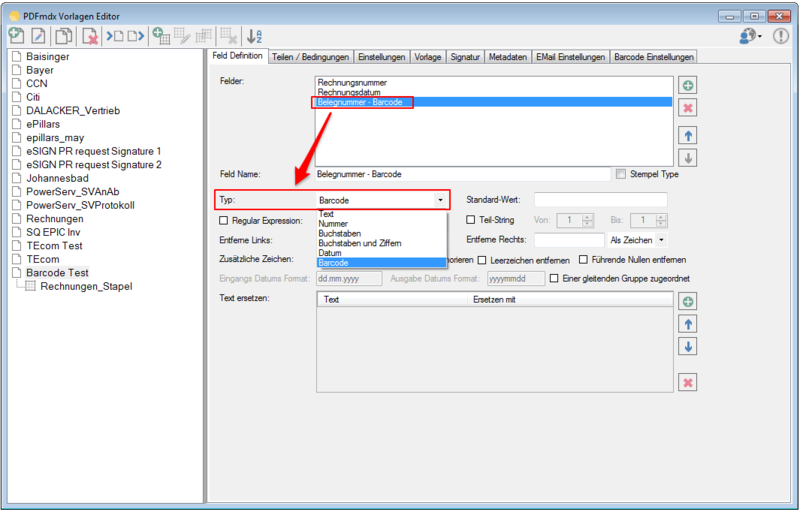 Page-oriented document processing – pages turn left, right, delete pages. Sites drag and drop into the thumbnail view. Total document split – at the marked page, by x pages or barcode. 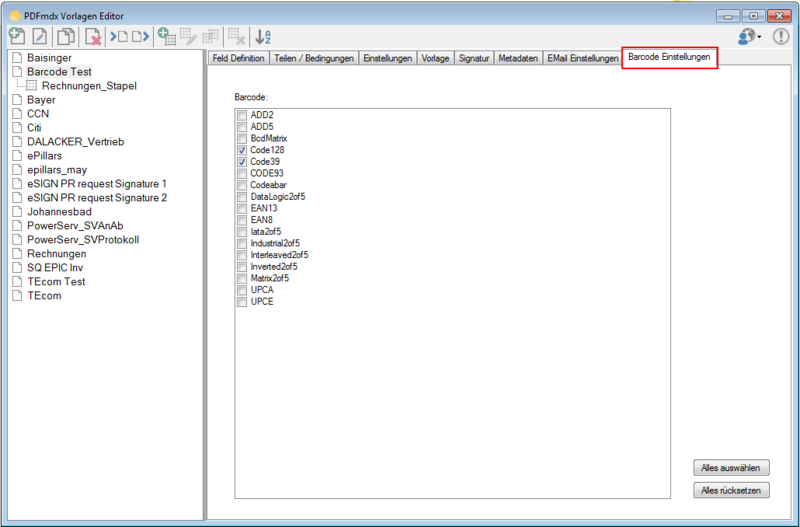 Individual documents merge – set order, automatic deletion of individual files. 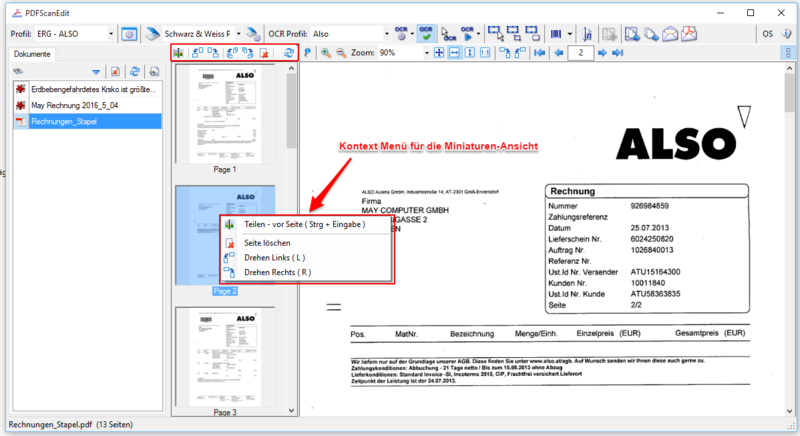 Smart OCR processing – only image pages are processed OCR – normal PDF pages are unchanged. Since 01/01/2016 we received repeatedly the message that our software Setup’s can not be installed on certain systems. It happens when you run Setup, an error message “invalid signature or corrupted cabinet file“. It is because from 01.01.2016 no SHA-1, but only SHA-256 Certificates may be used for signing software. But not every old OS version supports SHA256 certificates. “Effective January 1, 2016, Windows (version 7 and higher) and Windows Server will no longer trust new code that is signed with a SHA-1 code signing certificate for Mark-of-the-Web related scenarios (e.g. files containing a digital signature) and that has been time-stamped with a value greater than January 1, 2016. This cut-off date applies to the code-signing certificate itself. Any files signed with an SHA-1 certificate need to have a timestamp showing a date and time prior to Jan 1, 2016 for continued support. Those files will still be allowed through the ‘Mark-of-the-web” system until Jan 14, 2020, when all SHA-1 support will stop in all current versions of Windows. All new signatures created or timestamped after Jan 1, 2016 must be SHA-256 based signatures or they will cause a “digital signature is corrupted or invalid” error when downloading. What versions of Windows support SHA-256 signatures? SHA-256 signatures are not supported in Windows XP SP2 or earlier. SHA-256 is only supported in User Mode for Windows XP SP 2, Vista and Windows Server 2008R1 — SHA-256 certificates are not supported for drivers on any version prior to Windows 7. Microsoft is announcing the availability of an update for all supported editions of Windows 7 and Windows Server 2008 R2 to add support for SHA-2 signing and verification functionality. Windows 8, Windows 8.1, Windows Server 2012, Windows Server 2012 R2, Windows RT, and Windows RT 8.1 do not require this update as SHA-2 signing and verification functionality is already included in these operating systems. This update is not available for Windows Server 2003, Windows Vista, or Windows Server 2008. Please contact us in this regard, We then provide you with a setup without code signature. Then the software can be installed on “old” operating systems that do not support SHA-256 encryption. Sometimes it may be necessary to set the language code for the installation of an MSI setup manually. By default, the language setting of the system will be taken on which the software is installed. So there may be differences between the local installation of Setup and the installation, for example, the MS SCCM Server (System Center Configuration Manager). For the detection and automatic updates, it is necessary that the language code is unified. There is a dedicated MSI Parameter. When processing on the Windows service, the user interface need no longer be started.